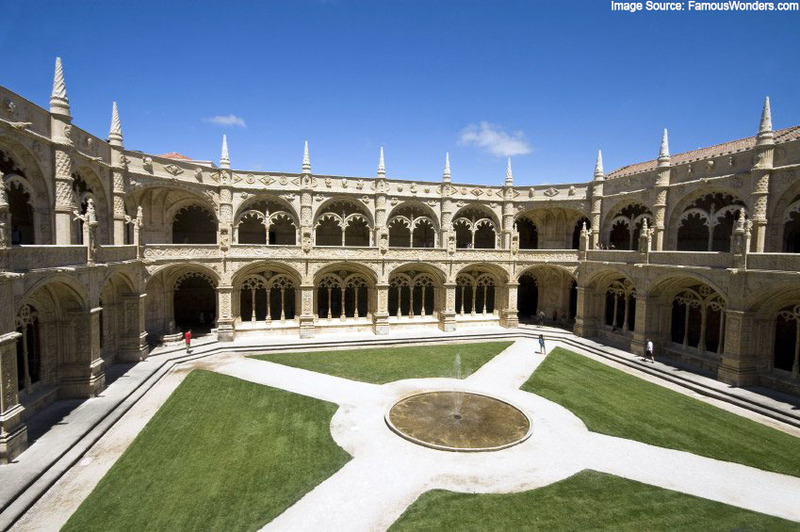 The Jeronimos monastery has a lively history: It was built on the request sent by Manuel I to the Holy See for authorization on the order of Saint Jerome to build a large monastery on the banks of the Tagus River in Parish of Belem, just outside Lisbon. The request was sent in 1496. 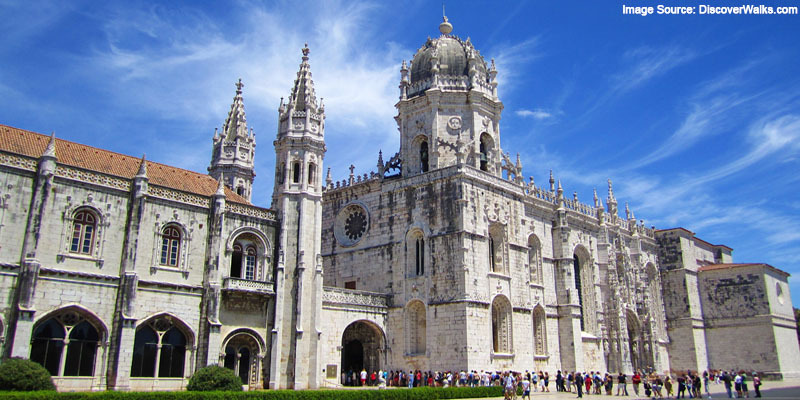 It replaced the church which had been existing formerly in the same place, which was dedicated to Santa Maria de Belém and where the monks of the military-religious “Order of Christ” provided assistance to seafarers in transit. The official name of the building is “Mosteiro da Santa Maria de Belem”. The Name is originated from jerónimo Portuguesetransliteration for Saint Jerome (Eusebius Sophronius Hieronymus); the use of Hieronymites, referring to the Order of Saint Jerome. It also bears a nickname of “O Jerónimos”. The King Manuel asked the Order of St. Jerome or the Hieronymites to occupy this new monastery. In return, the monks were supposed to perform daily masses and pray for Prince Henry the Navigator and, of course, the king and his successors. The monks acted as spiritual counselors to many mariners sailing from Belem. It is one of the standing tall structures that were under construction for longest duration of time. The monastery construction was started in 1501 and was concluded a hundred years later in order to commemorate the naval journeys and achievements of Vasco da Gama, one year after the beginning of the construction works as it was from here that Vasco da Gamaspent his last night before his voyage to the Far East. Jeronimos Monastery is also referred to as Hieronymites Monastery, derived from the names of first community monks to whom the monastery was entrusted. The building has a façade that extends over 300 meters. 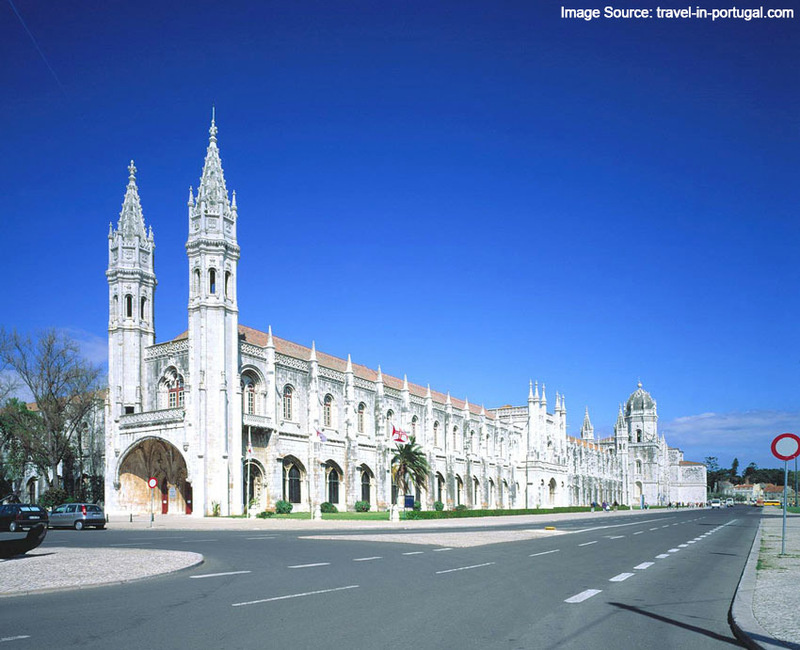 It showcases one of most prominent Portuguese Late Gothic Manueline styleof architecture. It follows the principle of horizontality and thus broadcasts a calm visage. The monastery is an impeccable epitome of Manueline architectural style: A richly and highly wrought architectural style with complex sculptural themes which incorporates nautical elements and objects discovered during naval expeditions, carved in limestone. The outstanding Portuguese design sums up Gothic, Moorish and Renaissance styles with maritime themes as a nod to the Age of Discoveries. In the 19th century the Monastery underwent isolated architectural interventions, which, while the original structure wasn’t altered brought about many changes which are broadcasted in the contemporary time. No plain columns have been used in the structure. Each column had an intricate design of flowers, rope coils, corals, sea and mythical characters, religious and royal symbols. Although there may have been a whole numerous beliefs, expectations and faith associated with it primarily such as King Manuel hoping Iberian Dynasty Kingdom would rule after his deathit was secularised on 28 December 1833 by state decree and its ownership transferred to the charitable institution, Real Casa Pia de Lisboa. It became a state property in early 1830s and was used as a college property until 1840. It is now a museum, a working church and a mausoleum. It was classified along with the nearby Tower of Belem as a UNESCO World Heritage Monument in 1983.